You know what else we recommend? Contacting info@nephronresearch.com to see how you can gain valuable insights on the impact of the flu on healthcare stocks. Below is just a sample of our thoughts. The current flu season is now tracking to be the worst we’ve seen since the swine flu pandemic back in 2009. Despite a typical spike in “percent of visits for influenza like-illness,” three weeks ago, we have not seen the typical seasonal abatement. Instead, each of the past 7 weeks have shown a new peak. An obvious impact of a strong flu season is an increase in emergency room visits and hospital admissions where most investors focus. Instead, we also point to the negative impact on managed care companies, particularly Medicaid plans. 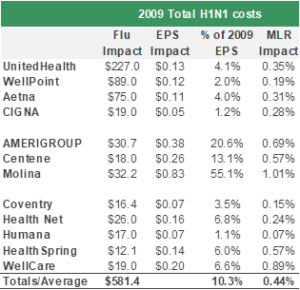 We did some digging and below is a chart summarizing the impact of the swine flu on earnings and medical loss ratios. The average EPS and MLR headwind in 2009 was 10% and 0.44% respectively. To learn more about our thoughts on the impact for this year, contact us at info@nephronresearch.com.